Variety is the spice of life — or so they say. That popped into my mind as I shortlisted and sifted through the candidates for this month’s edition of themes of the month as I had an unprecedented number of themes to choose from. Even when we take into account the relatively strict criteria that we follow (each theme must be under 100,000 downloads but be highly rated and recently updated/created), the depth of choice was still close to overwhelming. However, did the volume of themes available impact upon the quality of the five that made it through to this post? Only you can answer that — take a look and let me know what you think. Enjoy! I like to feature themes that cater to a niche audience whenever possible as it can get rather boring looking at blogging theme after blogging theme. Runo is specifically built for poets and writers, with the focus entirely on the written word. However, it’s not feature light — it has a custom menu, background and header image, three layout choices, widget support (sidebar and three footer widget areas) and advanced text/poetry editing tools. I look to include a business theme in most editions of themes of the month and I was a little spoilt for choice this time around. 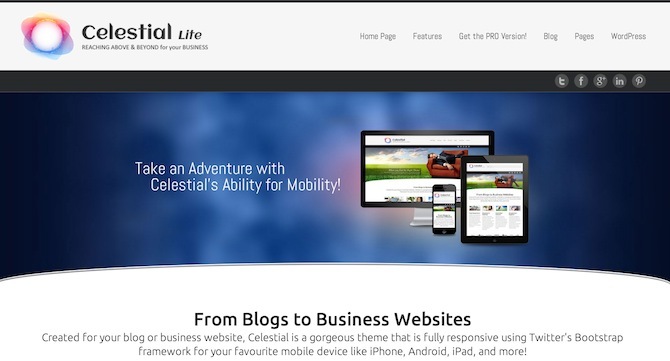 I decided to go pick Celestial Lite based upon its simple yet colorful design and intuitive layout. This theme doesn’t offer anything new or revolutionary but it is a striking minimalist design that is more than a little reminiscent of Twenty Twelve. 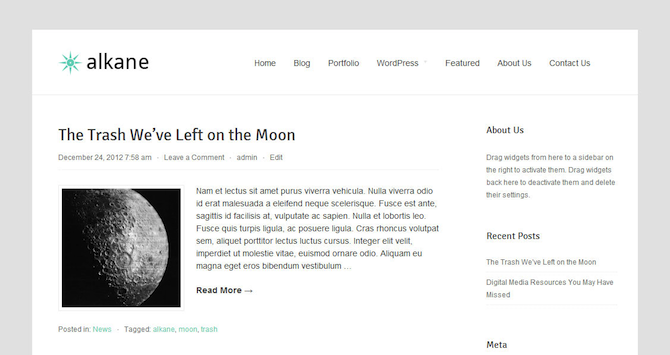 Alkane is one of those themes that I would recommend to someone getting started with WordPress, because it is something you can start publishing on straight away without having to get involved in theme customization and so on. If you do want to tinker a little then you have the option of uploading a custom header or background. Now it’s time for a little color. Citizen Journal certainly couldn’t be accused of blandness, but its colorful design is not only for show — the theme is highly functional and easy to navigate. The layout will be familar to anyone who has visited a blog before, but Citizen Journal injects a little personality into proceedings. This is another great option for beginner bloggers who want something perhaps a little more eye-catching than Alkane. We’ll finish with another solid blogging theme — one that is a notch down from Citizen Journal in terms of color and vibrancy. 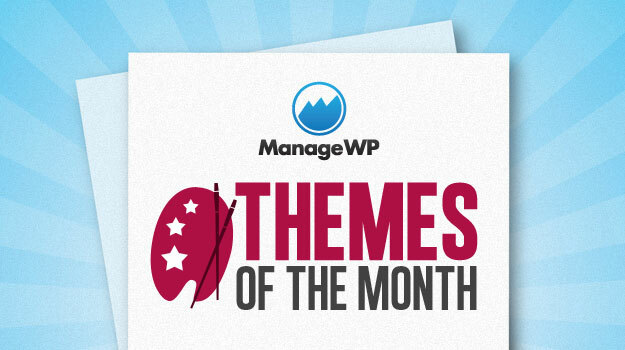 I’m a big fan of “boxy” themes like Color Palette so it was a shoe-in for me in this month’s themes of the month post. 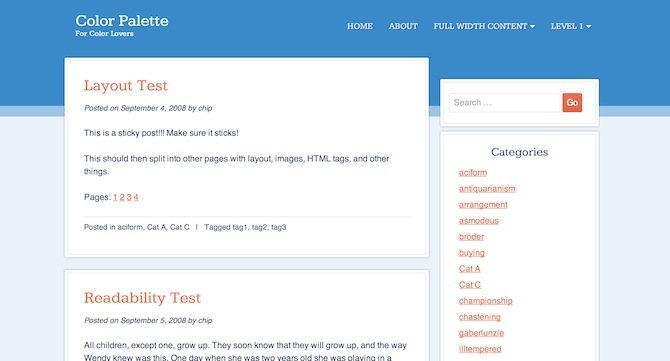 There’s just something inherently ordered and eye-pleasing about a theme that has clearly delineated sections — it is very easy on the eye and makes browsing through the different sections of any given page very easy. Citizen Journal is a nice one. Nice Post. I think celestial lite should be at first place :). It is awesome. All looks nice. Thanks for the share. Although these themes are looking great, honestly I didn’t like any of these.